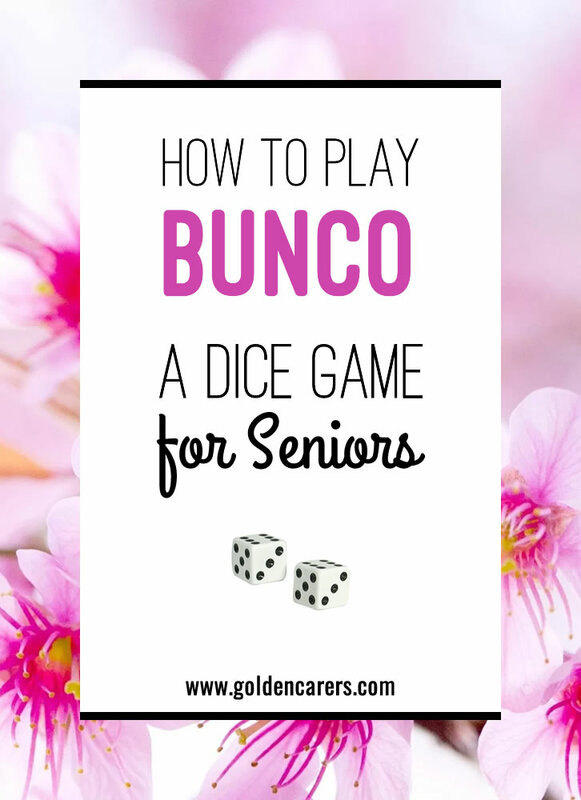 If you've never heard of Bunco, give yourself some time to learn and understand how it works. Remember that the best way to learn is to play, and even if you make some mistakes it's OK - that means you're learning! Bunco can be enjoyed by individuals, as well as up to 32 people playing together. I also play Bunko with my residents, but I have modified it quite a bit and they still enjoy it. It is their 2nd favorite game after bingo! We play individual instead of teams. We all sit at one long (or two tables put together) which I cover with a plastic table cloth to keep the dice on the table. Each player is given 3 dice. They take turns rolling their dice. The object is to get BUNKO or roll 3 sixes. However, each time a player rolls a six, they get a point and roll again. Also, 3 of a kind earns 2 points and that player continues to roll. (with the exception of 6's as that would be a Bunko. 2 sixes earn 5 points and that player continues to roll. Player continues to roll their dice until they do not roll any of the above. The 1st player to score 21 points wins the Game but if someone rolls a Bunko (3 sixes) its an automatic win. If you win a "game" (21 points) you receive 25 cents. If you roll Bunko you receive 50 cents. I keep score by making columns with the players name at top and tally marks as they roll. My residents love this activity. They cheer each other on and go crazy when someone rolls Bunko. For those who have trouble holding and rolling the dice I use small plastic cups.